In an attempt to design an underwater vehicle that can go into the depths of ocean, which are not, accessible or not safe for humans to dive in, scientists are studying the Ghost knifefish method of locomotion. The fish are known to hunt in the murky water of the Amazon basin with precision and to sense the environment, rely on the current that they pass through the water and whirl their long fin for smooth motion to move both horizontally (forward and backward) as well as vertically. 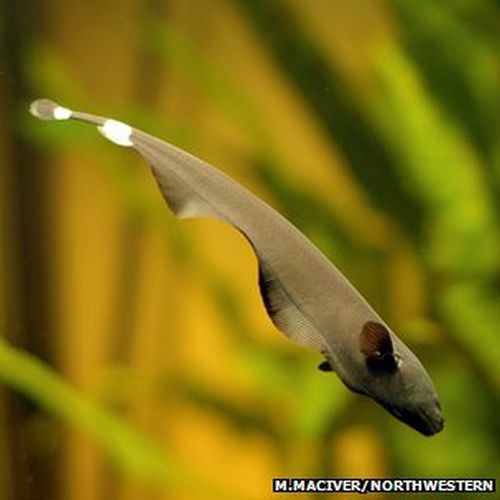 These two key features of the Ghost knifefish are being studied by the researchers at Northwestern University, US, with an idea to use them in developing an autonomous underwater vehicle that can move around in complete darkness such as inside the debris of a sunken ship. Prof MacIver assisting the team in developing the underwater vehicles has been indulged in studying the sensory and locomotive system of knifefish. The neurons present along the spinal cord produces an electric field for the fish. And any change in the electric field caused by a potential prey is sensed by the receptors present at the surface of their skin. The disruption is only one-tenth to one-hundredth of a millionth of a volt, but enough for the receptors to sense it. The fish has evolved in such a way that it can sense things coming towards it from any direction. Prof MacIver explained that the fish send out an electric field and the receptors embedded in the entire body surface helps in sensing any things approaching from any direction. This is what scientists are trying to simulate for their robot in a tank, so that it can sense things that comes around and react accordingly. 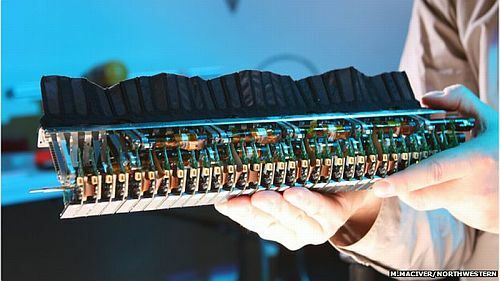 Along with this the propulsion technique that the knifefish uses are also of much interest to researchers who want to copy it for their robot. The long fin situated under the belly of the fish is used to send ripples in the water while moving. The fin when waved in one direction makes the fish move forward and when moved in the other, the direction of the fish movement gets reversed. To move up the counter propagating waves meeting in the center are used. Through various simulations done in the Prof MacIver’s lab, researchers have deduced mathematical relationships between frequency and amplitude of the moving wave and the amount of propulsion is received. And so they can now capable of using the technology. MacIver and his team in Northwestern’s Neuroscience and Robotics Lab have already developed many robots based on the knifefish movement and non-visual sensing and now hope to develop advanced underwater vehicles. And with such vehicles it would be easy for the researchers to explore the greater depths of oceans, which is still alien to humans and is very little is known about the kind of creatures that survive their where humans are not capable to reach.